I provide the bees a water source near their hives - but do they choose to visit it? Not when there is some nastier water source around. The bees seems to love water in gutters, on the tops of old flower pots, or in the tops of garbage pan lids. When my trash is collected, the garbage guys throw the tops on the ground. This one was left upside down for a week through a rare 24 hour rain in Georgia. 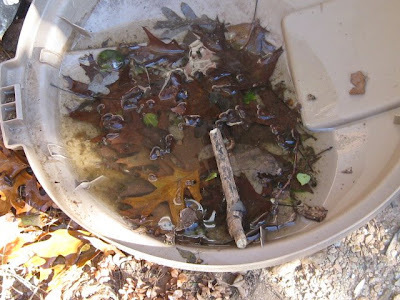 Result: A garbage can top filled with water and leaves. The bees need the water so they come here for it. Without anything to ride on, they often drown. When I discovered this water source, I also saw a number of drowned bees, floating in the pool of water. To help the situation, I added a stick so that the bees could stand on the stick and drink the water. I didn't get a picture of a bee on the stick, but below you can see a bee collecting water from the trash can lid. are you not afraid that the water is polluted? It's rain water - so no, I'm not afraid it's polluted - at least not any more than any other water the bees might find. If it were poured there from some can that held paint or something else, I might be worried, but it's rain water that falls on a clean plastic lid. The bees would rather drink gross standing water out of a gutter and would if it were available to them, but we are having a drought in Georgia. I tried leaving a water source for my bees the first year, but like yours they never visited it. My favorite book, "the Keeper of the Bees", talks about putting a little salt in the water. Have you heard of this? Have you tried it? This is a little off subject but when you said that you found dead bees floating in the water it reminded me of my hummingbird feeder. 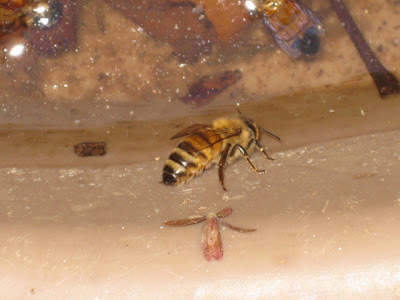 When I clean the feeder, I always find a dead bee inside. I wouldn't have thought it could get into such a small hole and I feel so bad when I find them. Do you have a suggestion for safely keeping them out? I don't mind that they share in the food ... I just don't want to kill them. The solution depends on the type of hummingbird feeder. Search via Google or Amazon for "hummingbird feeder bee guard". We keep our waterfall/stream running year round. We also have a salt water swimming pool. Although it's covered for the winter, we're always aware of saving any bees that get into trouble in the salt water. They do love the salt, I think. I've featured this blogsite on mine. Best to you and your bees! I've read that fruit-eating bats get their vitamin B-12 from drinking stagnant water - I wonder if that's true for bees as well? Tho the pollen should have B-12 (usually found in protein foods & fermented items) . . .
Just saw the movie 'Secret Life of Bees' at a little 'artsy' theater on the weekend - oh, what a lovely story! & so well done - Queen Latifa as a bee-keeper!! wow, nice post with very wonderful photos. My bees spent too much time looking for water this summer. 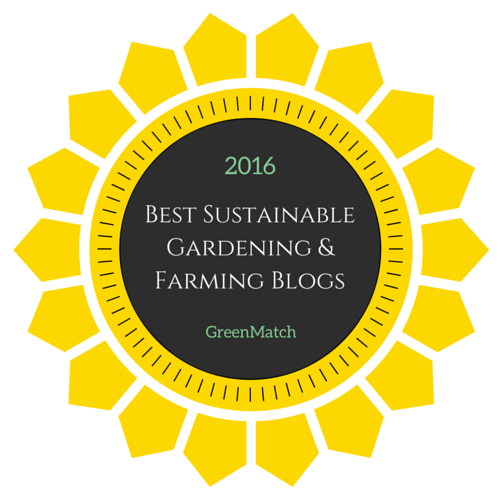 I read about a beekeeper using a watering feeder used by chickens. Sounded like a good idea and will try it next spring & summer. He puts rocks in the trough to allow the bees something to keep them from drowning. If they can no longer get to the nectar they should stop being attracted. In the short term take the feeder down from 9 am to 6 pm, that's when the bees are active. Once they no longer find nectar they will look elsewhere. Once you have the guards on it shouldn't matter. many parts of the country are experiencing a dearth right now just before the fall nectar flow (not so in Georgia where the fall flow is underway). Consequently they are starving for a nectar source and unfortunately your hummingbird feed fits the bill. Please don't kill them, but disrupt the cycle - take down the feeder for a few days and maybe they'll give it up or the goldenrod will start blooming where you are. Re hummingbird feeder bee drowning. Place a 1/2" screen just over the feeder tube so the hummingbirds can still sip but the bees will be blocked. Good luck! And thanks for trying to help the bees. We live on the Fraser River Delta. Today, there were probably over 50 bees in the water. Early in the day, I fished out 6 and they recovered. Tonight there was a much larger body of sludgey water with many more bees in it. I fished out about 25 but they are not looking good. They are cold and wet. Why are they becoming trapped in this algae? There are so many of them in just one small sludge-body. Does this mean there are bees in every one of these things that flow by our house at this time of year? How to water bees in Southern California and not nurture mosquitoes which carry West Nile virus? Have just set up microspray head to wet rough rocks when sprinkler runs. A friend suggested placing a wool cloth so it gets wet and will retain some moisture over time. Saw a bee inspecting a crumpled tissue on the ground. They are desperate. Another informative post. You just can't help but learn on this website. Why do the bees allow themselves to get trapped in the water? Surely they should have a natural instinct to avoid it!? Maybe they get trapped in water because they're "fuzzy" and the water soaks up in their hairs and weights them down. I've been keeping a bird-bath full of fresh water in a very dry/hot climate and the bees discovered it and have taken it over. They do seem a bit clumsy though, and I usually find one or two that have drowned. 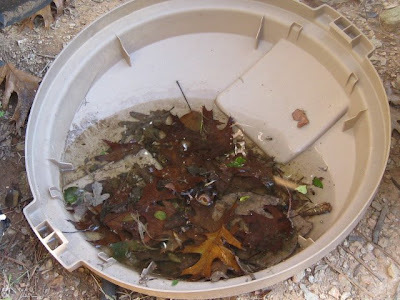 Has anyone tried using their feeder as a water source? I recently stopped feeding a new hive and was thinking about filling the feeder (inverted mason jar that slides into the entrance) with water. Any thoughts? Hive front feeders like the one you describe are great for keeping water available for the bees. They are really risky to use to feed sugar syrup, especially during a dearth, since they may encourage robbing and eventual attack from a stronger hive. try to put some salt in the water..or if your are not afraid for robbing put 500ml or less of syrup near your water source, when the syrup is over the bees will continue to visit the place for water. I water my bees with a pan of water and set a sponge in it. Quick and easy bees seem to use it when need. A small pond liner set 20 yards away from the hive with rocks piled in the center works well. Bees are attracted to chlorine (the other reason you find them so often in swimming pools), and adding a cap full or 2 of bleach also keeps the mosquitoes out. Mine has a small drain hole so the top rock is always a safe dry landing zone. Get a swimming pool test kit and monitor your chlorination. Keep it at a level at or below the level in your town or city water. And here in Romania use the trough for water, we use a board cut, the dripping water from a barrel and bees sits on the board of the trough so not drown and have water all the time and the important thing is not contaminated.